Speaking of furniture, just for the dining room, there were at least 3 sets (maybe 4?) to choose from for this dining area. My friends had a couple sets from their large house they had just moved from, plus the set that came with the condo… Or they could have chosen to just buy new dining area furniture too. However, we decided on one of the existing sets they had, which I’ll explain a little further down. There is only one natural light source for the whole space, the patio door at the far end of the living room. So taking down this wall achieved helping to spread that light into the great room. Another key design element to spreading that light was to use a lot of white. 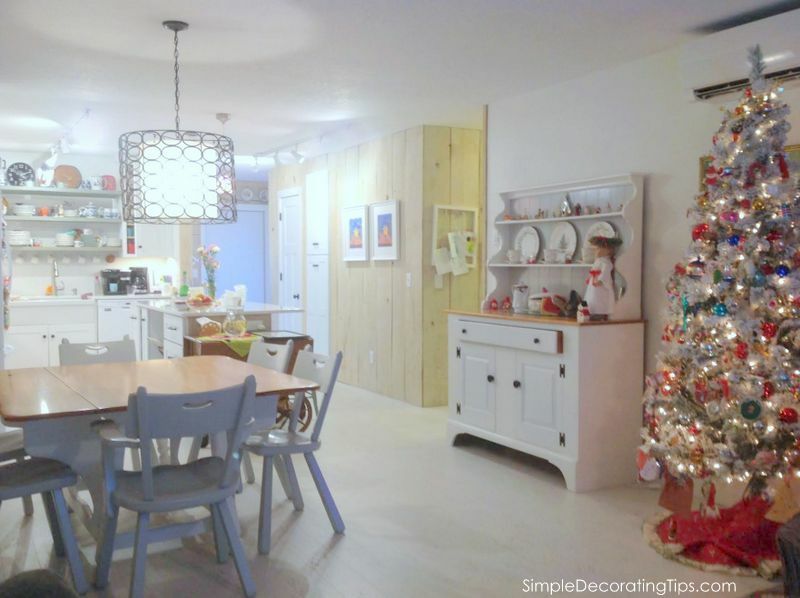 The ceiling, walls, cabinets are all white, the rough sawn boards on the wall were treated with a white-wash finish. Even the floor was changed out to white cork! This is the space in progress. The area adjacent to the kitchen, between that island above and the living room space (where the patio door is, which is behind me when I took this picture) is the dining area. It’s not a large space, but once the furniture defines the area, it is a very adequate space for a group of at least 6 diners. I helped my friends with their condo renovation, coming from my expertise as an interior designer. We used Pinterest for a central communication resource. My friend started the board with her inspiration pictures. I then added to the board by searching out some choices, depending on where we were in the renovation process, for them to select from. That process worked great for everything from the cabinets, door handles, light fixtures and even ideas for whitewashing the wood on the the walls. I mentioned at the beginning how renovating a small space can be deceivingly harder than expected… it also means that there isn’t that much space for tons of details, so you need to make the ones you do have space for count. They must encourage the overall look, style and color of the space, but most importantly, they must fit the function needs first. Shopping for items online can be a huge time and energy saver… however, I’ve learned (yep, the hard way) to be careful to check the dimensions and specs before ordering. It’s so easy to like the way something looks in the picture, giving little thought to what size it really is. I did my homework for my clients before I ‘pinned’ something. Or if she ‘pinned’ something that caught her eye, I made sure it was the right dimensions for the space. It’s perfect for their dining area. Style: modern, good… size: just right for the diameter of their dining table size, (oversized just a little to make a bold statement, but with the open work, still seems visually light-weight, and still comfortably inside the diameter of the table) color: grey and white, good… pattern: repeats the circle pattern of the penny tile we picked for the kitchen backsplash… perfect! This is the rug they purchased at the beginning, for the living area. I love having the textiles, like this rug in hand before selecting things like paint. You can always match any color of paint to a specific rug color, but it’s much more difficult and suddenly extremely limiting doing it the other way around… to try to match a rug or fabric to a paint color. My experience in designing and ordering pieces for clients also gives me first hand, (and very frustrating) knowledge that sometimes when you order pieces, either they don’t come due to crazy backorders, suddenly discontinued pieces, or they just aren’t right once you get it and you need to return it. It’s kind of hard to tell just exactly what that grey color really looks like isn’t it? Yup. That’s why having it in hand instead of just going off a picture of it, you can see in real life what color it is, in your space and in your lighting. As you can see… well barely see in this blurry pic… it was that traditionally orange stained maple finish. Nothing about that color of finish was right for this space. My friends hired someone to refinish and paint the piece. We used 2 colors of paint, grey and white, and sticking with the ‘Modern Swedish Farmhouse’ style I’ve coined for this condo renovation, I felt it was important to have some natural wood tones in it too. The counter top of the hutch was stripped and then just a clear finish applied so that it was that natural look. The overall main part of the hutch is white, with an accent of grey on just the back boards of the open shelves. The hardware was repainted black. For the table, again the top was stripped and left with a clear, natural finish. The rest of the table legs and base were painted white. Isn’t the style of those chairs so sweet? On each drop leaf side there are 2 of these curved swing arm supports. Hung the appropriate 36″ from the table top to the bottom of the chandelier. That 3′ space gives you the amount of space you need to not feel like the fixture is falling onto the table, or block your view when you’re seated, but not so high that it doesn’t visually connect with the table. I think the tea cart, that she uses all the time, would look fabulous painted a light pale aqua. Fun color for a super traditional piece. Another piece is that tall cabinet in the corner… maybe black? Or maybe just leave them as is. The dining area details are still a work in progress, but the main ‘bones’ of it are done and make this space work and look great. Be sure to stay tuned in… I will be posting many more details of this ‘Modern Swedish Farmhouse’ condo renovation in the weeks to come. OH WOW!!! You know I love knocking down walls, this space looks nothing like it did in the beginning. You guys did an amazing job!!! Thanks so much Kristin! It does look so much different now. Liz the space looks light and airy. what a great idea to knock down that wall. And I love the repainted furniture. I also really like that unique lighting fixture. Now I’d like to see the living room with the cool rug.